When restoration work began at what is now Pleasant Valley Conservancy, the area was heavily infested with undesirable woody vegetation, both brush and trees. The original savanna oaks and hickories were still there, with their open-grown character visible, but surrounded and crowded with "bad" woody plants. The invaders were all fire-sensitive and had encroached during the 50 or so years since the last burns. Early attempts to knock back the invasive woody plants by fire were unsuccessful, as there was insufficient fuel on the ground. In retrospect, fire should not have been used at that stage anyway, since all it would do was top-kill the woody plants, but not eradicate them. They would resprout from dormant buds and a bigger mess would be created. We were thus "lucky" that fire did not work. Herbicides play a central role in restoration ecology, but they must be used carefully and with full knowledge of their potential activities. Each herbicide sold comes with a label that provides essential information about the chemical, its activity, and precautions that must be taken when using it. It is mandatory that before using any herbicide its label must be read and understood. Uses of herbicides for specific weeds and woody plants are given below and on other pages of this web site. This link provides a summary of the main herbicides used at Pleasant Valley Conservancy. When cutting a tree or shrub, it is important to know whether it is a sprouter or nonsprouter. 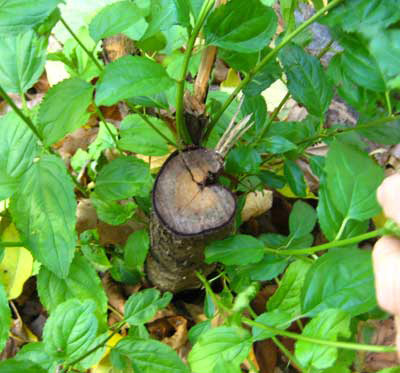 If it is a sprouter, then the cut stump must be treated with herbicide to prevent resprouting. They have dormant buds in both the stem and in the root collar. If a shrub is cut below the lowest stem bud, it will sprout from one of the root collar buds. If cut higher, then resprouting will occur from the first dormant bud below the cut. In either case, to prevent resprouting, it is essential that the cut stem be treated with herbicide. Conifers (softwood plants; whose leaves are needles) such as pines, red or white cedar, spruce, etc. The stumps of these trees do not need to be treated with herbicide. Sprouters are all the hardwoods (broad-leaved plants) that will be encountered during a restoration project. These include black walnut, slippery elm, box elder, black cherry, basswood, hackberry, and any of the oaks. Aspens are sprouters, but are a special case. They must be dealt with by girdling. The stumps of shrubs and trees that sprout should be treated with an 15-20% solution of the herbicide triclopyr dissolved in an oil such as bark oil, diesel, or kerosene. Trademarks of triclopyr include Garlon, Access, Crossbow, etc. Black oak stumps that have been treated with Garlon 4 (in oil) to prevent resprouting. The blue dye shows where the herbicide was applied. Only the outer layer of the log, which includes the cambium layer, needs to be treated. These two black oaks were removed because they were crowding an adjacent open-grown bur oak. For small projects, part-time workers can be hired, but for major projects a contractor who specializes in restoration work should be used. If volunteers are available, they should have experience with tree cutting and should be required to wear appropriate safety equipment (chaps, hard hat, goggles, ear protection, etc. 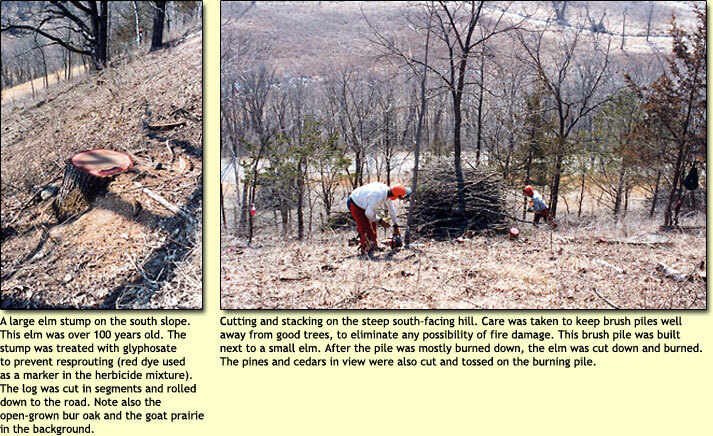 ), although unskilled volunteers can be used to help with burning brush piles and treating cut stumps. 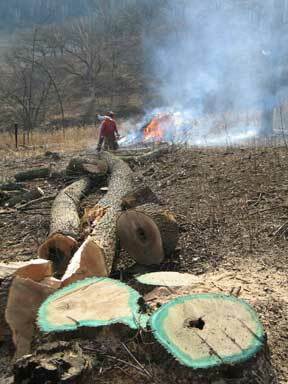 For oak savanna restoration, all trees that were not part of the original fire-dependent ecosystem should be removed. If resources are not available for a complete removal, special attention should be given to trees that are crowding open-grown bur or white oaks. A few oaks may also need to be removed. Black or red oaks are rapidly growing trees that often grow into the crowns of savanna oaks. If they are crowding white or bur oaks they should be removed. Other tree species to remove in an savanna restoration include elm, black walnut, cherry, basswood, maple, and box elder. Some shagback hickories might also be removed, although a hickory standing by itself can be left. Woody shrubs should be removed at the same time the trees are cut. Woody shrubs include buckthorn, honeysuckle, gray dogwood, sumac, black cherry, and prickly ash. Although some of these shrubs are native, they are often rather invasive, especially in the increased light provided by the clearing process. The cut stumps of woody shrubs should be treated with herbicide at the same time the tree stumps are treated. The good wood generated in the clearing process should be salvaged, for use as either fire wood or as lumber. However, heavy equipment should not used to remove logs, since it may damage the roots of trees being retained. Wood suitable for firewood can be cut into short pieces and removed with a pick-up truck. Excess wood can be left at the side of a road, where local residents will quickly remove it. If off-road driving is required, this should only be done in the winter (at snow-free times), and care taken to avoid making ruts. Frequent off-road driving over the same track should be avoided. Growth of savanna plants the following season will quickly hide whatever ruts remain. Logs suitable for the saw mill can be skidded over snow to a nearby road in the winter. Brush that is cut should be stacked into large piles, together with the smaller limbs of the trees, and burned in the winter when snow is present. The number of burn piles should be kept to a minimum. As much as possible, dead trees can be left standing as habitat for woodpeckers and other wildlife. Such dead trees sometimes presented problems during controlled burns, but this risk is acceptable in the interest of creating desirable wildlife habitat. Aspen cannot be simply cut like other tree species, but must be girdled. Details are given below. The lower part of the south-slope, which was predominantly prairie, was cleared first, and the upper slopes and ridge top, which were savanna, were cleared later. This was primarily a budgetary decision. It was less expensive to clear the south slope because there were fewer undersirable trees and removal of the cut material from the hill was relatively easy. Although cutting trees on the ridge-top savanna was easier for the workers, because it was on more level ground, removal of cut material was more difficult and expensive. The slower pace of savanna clearing was also necessitated by the need to have seeds to plant in the cleared areas. Since we were trying to use only local seeds, we had to phase in the clearing with the seed collecting possibilities. In general, around 10-15 acres of savanna were cleared in a single winter. The schedule of clearing is shown on the table below. 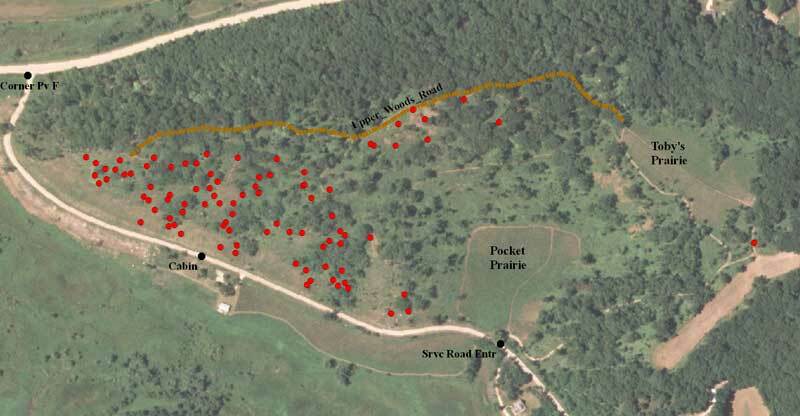 Although most of the cost of the prairie and savanna clearing was paid for by Savanna Oak Foundation, Inc., two helpful grants were obtained from federal agencies. The Wildlife Habitat Incentive Program of the U.S. Department of Agriculture provided a grant for the work in 1999 and 2000. The Private Lands program of the U.S. Fish and Wildlife Service provided partial support for the work carried out in January-March 2003. 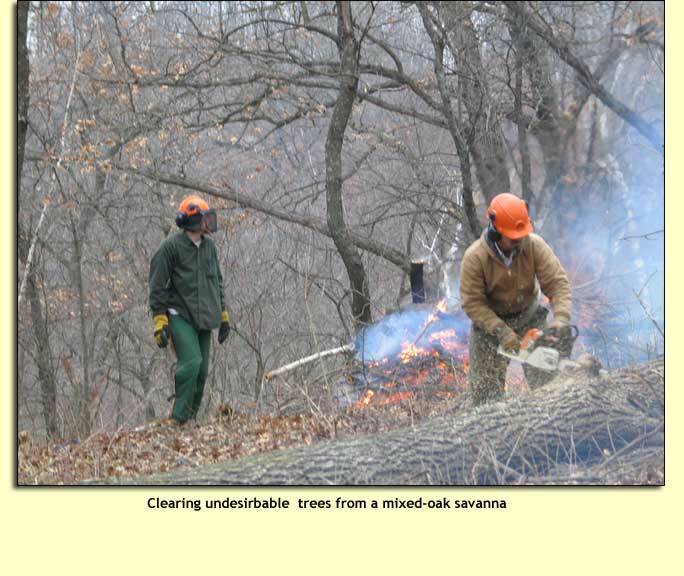 During the main period of tree removal, from 2003-2007, all restoration work was funded by the Savanna Oak Foundation, Inc.
A partially cleared south-slope hill (Unit 6), November 1999. The brush and small logs were stacked for drying and later burning. Large logs were rolled down the hill to Pleasant Valley Road and cut up for fire wood or saved for lumber. The cedars in view were cut and tossed on the burning piles. Several remnant prairies can be seen. The lower (just above the brush piles) is primarily little bluestem, and a small "goat" prairie is visible at the top of the hill, under the rocks. This latter consists primarily of big bluestem. 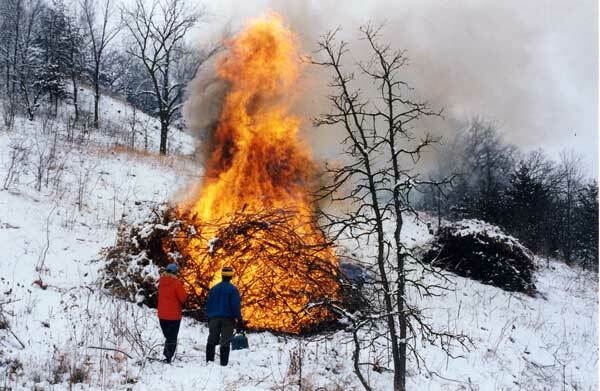 The brush pile shown in the photo above being burned in light snow, January 2000. Drip torch fuel is used to start the fire. 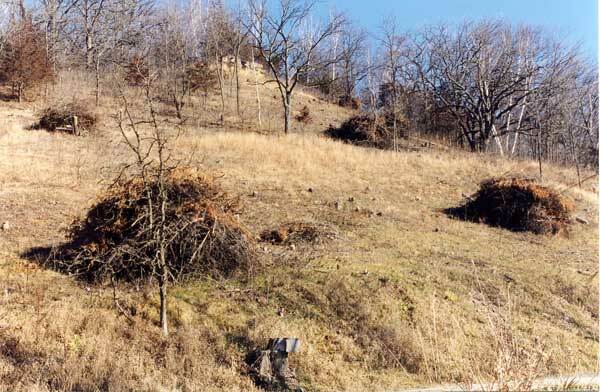 In the winter of 1999-2000 over 200 large brush piles such as this were burned on the south-facing slope. Clearing brush from a small area of nice savanna white oaks in Unit 12B. First savanna burn. Elm, black walnut, box elder. There are two species of aspen that are native to our area: trembling aspen (Populus tremuloides) and big-tooth aspen (Populus grandidenta). Pleasant Valley Conservancy had both species, although trembling aspen was the more common. We worked hard to get rid of these trees, and were rewarded for our work by the discovery that hidden among the aspens was real prairie sod. Aspen clone encroaching on a former agricultural field. Within about 50 years the size of the field had been reduced almost in half. Aspen are native trees but remain undesirable inhabitants of prairies and oak savannas. Aspen are capable of spreading rapidly and crowding out other vegetation. Aspen are pioneer trees on open , burned, or cut-over land. Although important economically in the paper industry, they are a menace in prairies and oak savannas and eradicating them became an early goal of our restoration. Although aspens grow from seeds, the primary spread is asexual by underground runners. The typical aspen "grove" is a multi-stemmed clone in which all the roots are interconnected. If an injury to a root occurs, there will be a rapid response by the clone, and new shoots ("suckers") will be sent up all over the area. New shoots have been known to arise as far as 50 feet from the nearest aspen tree! The clone may expand simultaneously in several directions, as influenced by environmental conditions. 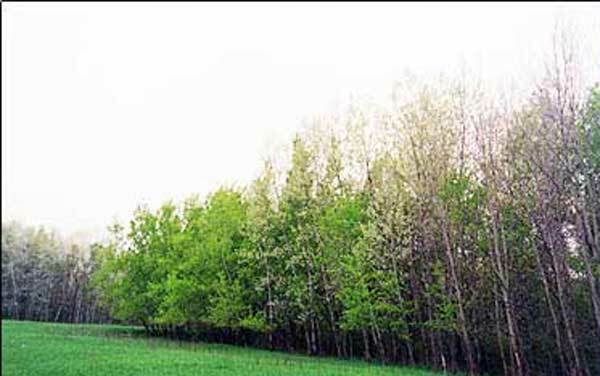 In western United States , huge aspen clones have been found, the largest occupying over 100 acres. In our part of the country, aspen clones are smaller, but are often more than an acre in extent. Aspen clones are widespread in the Driftless area of southwestern Wisconsin . They are easy to spot in spring when the light green leaves first appear, and in the fall, when the leaves take on their distinctive fall color. Virtually every woodlot in our area has one or more aspen clones. This was not always the case. In earlier times, aspens were uncommon in our area. This was because aspens are fire-sensitive, and when prairie and savanna fires were widespread, they were held in check. The first air photo of Pleasant Valley Conservancy, taken in 1937, shows that the land was quite open. Fire protection and elimination of grazing resulted in a major change. Subsequent air photos showed our land gradually becoming wooded. Many of the trees were aspen. The air photos from the 1990s show virtually no open land at all, and our field studies showed that most of the trees were aspen. We have identified many trembling aspen clones, in different parts of the Conservancy. There was a small clone above unit 1 (the goat prairie), two or three very large clones in the White Oak Savanna (unit 12A), at least three clones that surrounded the upper agricultural field (see photo at top of page) that was later planted to prairie in 1998 (now called Toby's Prairie). There was also a large clone at the lower end of the White Oak Savanna, bordering the ag field that is now the Pocket Prairie. Also, there were two or three clones surrounding the ag field that is now the Ridge Prairie. Small clones were also present in the lower part of Unit 11. Finally, there was a clone of big-tooth aspen in Unit 19. This clone was also invaded with white sweet clover, a persistent weed that is devilishly difficult to eradicate. Girdling When looking at a large aspen clone, it may be tempting to go in with a chain saw and cut it down. Wrong! The roots remain alive and immediately send up a huge number of new shoots. An area that had perhaps 5 or 10 large aspen trees will soon have hundreds of aspen stems. There is only one certain way of killing aspen and this is by girdling. The photos below demonstrate the technique of girdling. Girdling is done in May or early June when the sap is running fast and the tree is growing. At that time, the bark can be easily cut and the girdled bark stripped off. Later in the summer, it is virtually impossible to do a girdle properly. We carried out a small girdling in 1995 and initiated major girdling in 1997. Our major girdling was done in 1998 and 1999, but some girdling was done in 2000, 2001, 2002, and 2003. The trees girdled in 1998 (see photos here) died in 2000 and were cut, stacked, and burned. Almost all the trees that were girdled are now dead and have been removed. The dead trees of the major aspen clone in unit 12B were finally cut and removed in the spring of 2002. Although we still have many aspens on the east end of Pleasant Valley Conservancy, aspens in the highest quality land are now gone. We did our final aspen girdling in May 2008 in the area we call the East Basin (Unit 22). This isolated basin was not cleared until the winter of 2007-2008. There were close to 100 aspen in this clone, many of them quite large. The technique for girdling aspen. The tool was made from a truck spring. The tip of the spring was rounded off and one edge sharpened. The curve of the tool makes it easy to encircle the bark. It is important to make sure that the bark is completely broken all the way around the trunk. At least six inches vertically should be separated. It is important that every aspen tree in the clone is girdled. An unexpected result of removing the aspens was the discovery that hidden within one of the clones was real prairie sod. Conservative species such as Panicum leibergii and Viola pedatifida had managed to survive within the clone. Once the aspen were gone, these species (and others) were able to thrive. Today we can identify the exact boundaries of this aspen clone from the "good" species that are now present. Although girdling is very effective, small aspen resprouts may still come up at the edge of girdled areas. These can be handled by cutting with a hand clippers and treating the cut stems with glyphosate, and we continue to do this every year or so. Restoration work of the kind described here is expensive. During the largest efforts described in the table above, the costs ran between $3000 and $5000 per acre. These costs were for an experienced crew who worked very efficiently, and includes cutting of trees and brush, stacking and burning, and all herbicide treatment of cut stems. It does not include the cost of removal of firewood except where the wood could be rolled down the hill to the town road. The two major techniques for brush control are 1) cut and treat and 2) basal bark. Each method has its appropriate uses. Cutting mixed small brush: brambles, buckthorn, gray dogwood, etc. The blade is kept very sharp, level, and close to the ground. Each cut stem is treated with herbicide using the paint stick method. Treating cut stems with herbicide, using the paint stick method. The treating crew follows the brush cutter and treats every cut stem. If buckthorn is present, Garlon 4 in oil is necessary, but for gray dogwood, willow, and brambles, glyphosate can be used instead. This work can also be done in the winter, provided the snow is not too deep. It is essential to add a dye to the herbicide mixture so that the treatment process can be monitored. With the basal bark method, cutting is not required. An oil-based herbicide is used (such as Garlon 4), and the herbicide is "painted" up the stem of the woody plant. This technique is used for infestations where the "woodies" are scattered. The herbicide can be applied from a backpack sprayer or spray bottle. If the target is small brush, the paint stick method is used (as shown below), since it permits more precise application of herbicide. The paint stick method for basal bark treatment of small buckthorn plants. The herbicide-containing paint stick is swiped up the side of each stem. With stems this small, only one side needs to be treated. Most people involved in restoration of native landscapes learn quickly about the evils of invasive woody plants. The principle culprits in our area are bush honeysuckle, common buckthorn, and prickly ash. The first two are exotics, introduced in this country from other parts of the world. Although prickly ash is a native, it is still a problem because it is so unpleasant to have in the woods. All three are fire-sensitive, and they are classic invaders of areas that have been protected from fire. Another group of invasive plants that are a problem primarily in savannas are the various Rubus sp. (brambles; black and red raspberry, blackberry, dewberry). Although native, they are so invasive that their control is essential. Without control, large areas of restored savannas will become virtually bramble monocultures. Finally, sumac (both smooth and staghorn) are native species that are highly invasive and must be kept under control. Honeysuckle has been especially bad at Pleasant Valley Conservancy in areas that had been disturbed, either by previous logging or by tree fall. Buckthorn was especially bad in the bur oak savannas. Prickly ash was specially bad in savanna areas that had once been grazed. In shady woods, brambles are only a minor component, but once increased sunlight becomes available due to savanna restoration, they flourish. All of these species are being removed as part of our savanna restoration work. When we first started restoration, we focused on these three shrubs in the understory of the savanna. Because we had not yet begun serious cutting of larger trees, we hired an herbicide applicator to carry out basal bark treatment using trichlopyr (Garlon 4) mixed in diesel fuel. Garlon 4 is oil soluble and passes readily through the bark. It is translocated to the roots, where it acts. The basal bark procedure used was to mark 100 foot wide swaths from the bottom of the hill at Pleasant Valley Road to the top of the ridge. The applicator then moved up the hill, back and forth, spraying the base of each stem with the Garlon mixture. The spray was spread in a zone about six inches high around the base of the stem. A blue dye was used to control the spraying pattern. Everything in the path that was bad: honeysuckle, buckthorn, prickly ash, was treated. Due to the volatility of the treatment, the work was done in the winter. 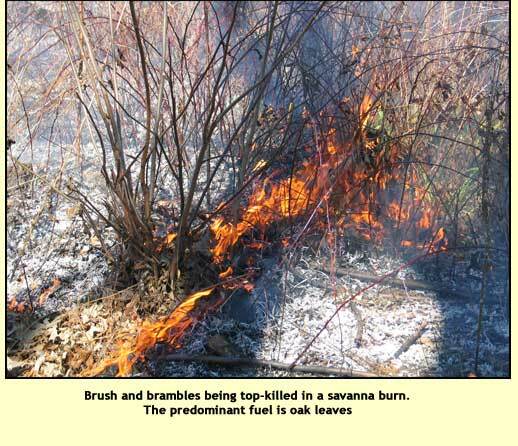 This approach worked quite well, and surveys the following year showed that over 90% of the target shrubs were killed. 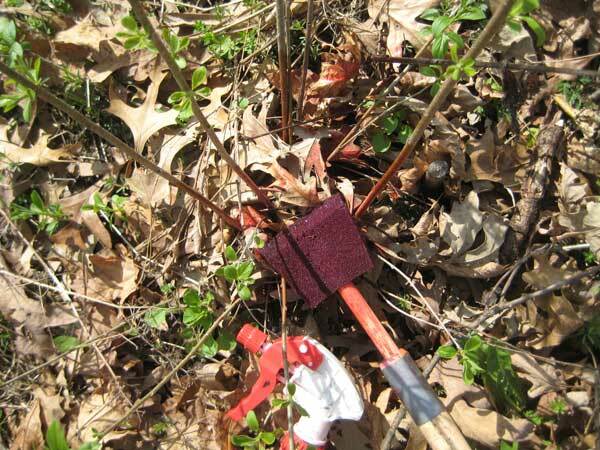 This procedure has also been used on invasive shrubs in the oak woods. There are several species of bush honeysuckles that cause problems in our area, including Lonicera morrowii, L. maackii, L. tatarica, and the hybrid Lonicera X bella. However, there is no reason to attempt to distinguish them since they are all nonnative and they are all bad. The native honeysuckle in our area (Lonicera reticulata and L. dioica) can easily be distinguished from the bad ones because the natives are all woody vines rather than bushes. Bush honeysuckles are upright shrubs ranging from a few feet to 15 feet tall. They form many branches from the base, and the spreading branches shade other plants. In a honeysuckle "thicket", almost nothing will be found under the canopy. (After the honeysuckle is removed, the soil is often bare.) Honeysuckles form fragrant tubular flowers, followed later by red fruits. Birds are attracted to the fruits and spread the seeds. Bush honeysuckles have a wide environmental tolerance, but they prefer partial to full sunlight and are most commonly found in abandoned fields, forest edges, roadsides, and other open upland habitats. They are extremely invasive and can easily take over and dominate a habitat. Bush honeysuckle is one of the plants that will invade a habitat if it is protected from fire. Once honeysuckles have conquered a habitat, there is no possibility of fire because there is no fuel. In order to reintroduce fire, it is essential first to eliminate the honeysuckles and then reseed with native plants, preferably seed mixtures containing grasses that will carry a fire. Both mechanical and chemical methods are used on honeysuckle, and often both together. The most assured method is to cut all the stems of a plant and treat each cut stump with a 20% solution of glyphosate. The concentration given here is percent of the active ingredient. 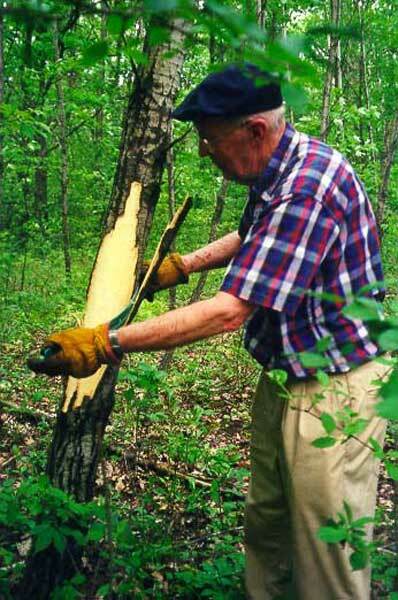 Honeysuckle can be cut with either a brush cutter or a hand lopper. 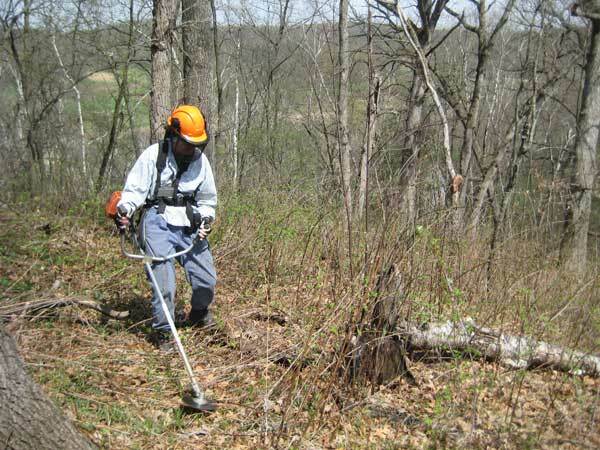 For an occasional plant, a hand lopper is fine, but for any extensive honeysuckle thicket, a brush cutter is essential. With a brush cutter, a sharp saw blade is preferable. For very large bushes, a chain saw must be used. However, a single person can also make significant inroads into a honeysuckle thicket. Here is a procedure guaranteed to work: Cut each stem with a hand lopper or handsaw, counting the stems as you cut. Cut the stems as close to the ground as possible, but still leave a small amount of stem showing above the soil layer. Pull all cut stems away from the base. Now treat each cut stump carefully with the glyphosate mixture. 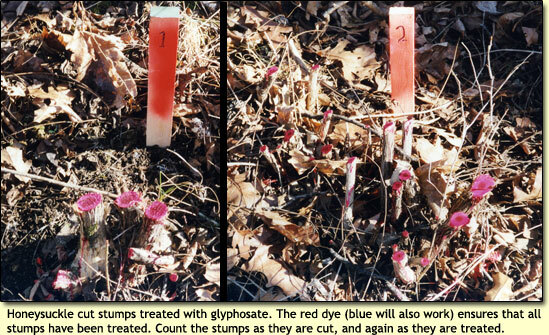 It is strongly recommended that a red or blue dye be added to the herbicide mixture, so that treated stumps can be distinguished from untreated ones. (Dyes suitable for herbicide use can be obtained from an agricultural chemical supply house.) As you treat, count each stump again, and do not stop treating until you have treated every stump you have cut. If a spray bottle is used, do not spray the whole base, since this wastes herbicide and spreads it around. Instead, place the tip of the spray bottle onto each cut stump, press gently to bring up several drops of solution, and spread them around the cut stump with the tip of the bottle. The whole cut stump should be colored with the dye/herbicide mixture. With practice, this procedure works quite well and the honeysuckle plants should not resprout. Small honeysuckle plants can also be killed by spraying the leaves with a 1-2% solution of glyphosate (active ingredient). It is important that all leaves be sprayed. 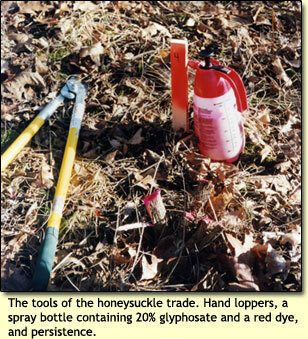 Honeysuckle is so sensitive to glyphosate that the plant should be killed within a few weeks. 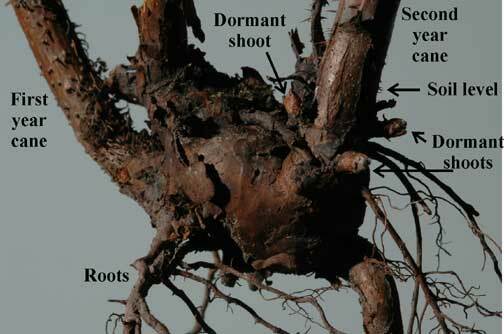 More importantly, the root system is also killed, and within a year the dead shrub can be readily pulled up. Honeysuckle is very persistent, and will resprout readily if not treated with herbicide. Please note: There is no point in cutting honeysuckles if the cut stumps are not going to be treated with herbicide. We do not recommend hand pulling, as some authorities do, because it disturbs the soil and opens it up for establishment of weeds. After the honeysuckles have been taken care of, the area should be reseeded with native species. This is especially important because when the honeysuckles were removed a "hole" has been created, into which weeds will readily move. In fact, if the honeysuckles were almost solid, it might be preferable not to remove them all at once, but to gradually cut them back, seeding with native species as you go. It may take several years to eliminate the honeysuckles in this way, but this may be preferable to creating a habitat full of weeds! Once large honeysuckles have been eliminated from a natural habitat, the work is not finished. There will be a seed bank, so that small honeysuckles will appear next year. Fire will top-kill these new plants but will not eliminate them. It is essential to return to the area periodically to remove new growth. Because of buckthorn's importance, Tom's Blog has many entries on its ecology and eradication. A list of these entries, with URLs, can be found at this link. Buckthorn (Rhamnus cathartica) is one of the more annoying invasive plants to deal with. Introduced in the 19th century, it has become well established over eastern North America. Even though its evils are now well recognized, it is still sometimes used commercially as a hedge or ornamental. Buckthorn infestation in a natural area in late fall. This species retains its green color long after all native species have senesced and turned brown. At this time of year it is very easy to detect.Note: This photo was NOT taken at Pleasant Valley Conservancy! In many natural areas buckthorn is the predominant understory shrub in woodlands and savannas, and it is also common on roadsides. The buckthorn plant may grow as a many-stemmed bush up to 10-15 feet high, and when older can often take the form of a small tree up to 30 feet high. Many specimens in well established stands can be over 50 years old. It produces a chemical that is toxic to other plants, which may explain the monospecific stands it often forms. Although the species is dioecious, the ratio of female to male plants can be as high as 6:1, making it a prolific berry producer. A very high seed bank (620 seeds/ m2 ) was reported in Canadian work. Buckthorn plants produce a chemical (toxin) which is active in soil. A major buckthorn infestation may result in a "buckthorn desert". After eradicating the buckthorn plants, it may take a few years for the toxin to dissipate. According to work in England, where it is native, common buckthorn is a strong calciphile, and is found chiefly on alkaline peat and limestone soils. This may explain its absence from many sandier areas. 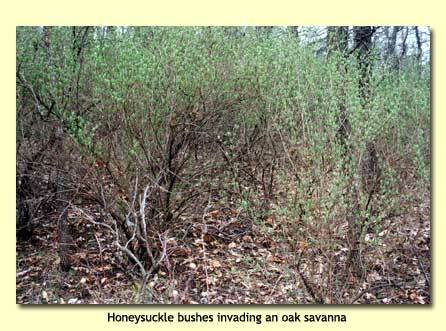 If an oak savanna area has a lot of buckthorn, special attention should be placed on its eradication. Although the original (“old-growth”) buckthorns are readily eliminated by cut stem or basal-bark herbicide treatment, the huge seed bank makes total eradication much more difficult. The first growing season after the buckthorns have been removed there may be a large number of small seedlings derived from the heavy seed bank. If allowed to persist, within a few years there will be small patches and major infestations visible. The buckthorn have a very extensive root system with rhizomes growing horizontally sometimes 5-10 feet to areas where new shoots develop. The root system of buckthorn is a massive fibrous tangle of small and large roots. 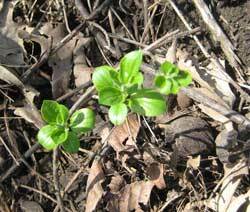 Buckthorn seedlings coming up in an area where a large infestation had been cleared the previous winter. The seed bank is quite prolific. Pulling buckthorn plants does not eradicate an infestation It is virtually impossible to pull up all of the tangled underground plant mass of a buckthorn stand. The following year new shoots arise and reinitiate the infestation. Fire does not eradicate buckthorn plants. Buckthorn plants are not eliminated even by annual burning. All fire does is top-kill the shoots. Numerous dormant buds then begin to grow and send up stems. In some cases, as many as a dozen new shoots can arise from a single root collar. It is possible that in restored prairies, where much hotter fires occur and tall grasses and forbs shade the soil, that buckthorns will be outcompeted, especially if the prairie is burned every year. However, in savannas and open-oak woodlands, where buckthorn infestations are most common, hot fires are less common and most of the understory plants are not tall grasses. Girdling does not eliminate buckthorns. Although several weed manuals prescribe girdling as a method to eliminate buckthorn, this is completely ineffective. The following year there will be numerous shoots arising from the area below the girdle. Buckthorn plants have numerous dormant buds just waiting for the elimination of apical dominance. Herbicide treatment is essential for eradication of buckthorns, but not all herbicides are equally effective. Many reports have prescribed the use of glyphosate for treatment of cut stems of buckthorn. Although glyphosate is effective for winter treatment of cut stems of large buckthorn shrubs, it is ineffective for treatment of the small cut stems that develop from the seed bank. Probably because of the massive root mass, getting the herbicide to the critical parts is impossible if herbicide is only dabbed on the tiny cut stem. The only herbicide recommended for cut stems is triclopyr, sold under tradenames such as Garlon or Element. The oil-soluble version (Garlon 4 or Element 4) and it should be used at 15-20% concentration. This permits use as a basal bark treatment. Both the cut stem and the stem below the cut should be treated. For small buckthorn stems, basal bark with the paint stick method works very well. Use Garlon or Element 4 at 15-20% in oil. The fall of the year is an excellent time to work, since buckthorn retains its green leaves after the native vegetation has turned brown, making it easy to detect. Extensive resprouting around a buckthorn cut stem that had not been treated with herbicide. Triclopyr (Garlon 3A or Garlon 4) is the most effective herbicide for buckthorn, both small and large. For the large buckthorn shrubs, it is very effective as a basal bark or cut stem treatment (Garlon 4 at 15% active ingredient in oil). For the large patches of small plants from the seed bank, it is effective as a foliar spray (active ingredient of 3-4% Garlon 3A in water). It is essential that follow-up in future years be done, and any missed plants treated. However, although not recommended for cut stem treatment, glyphosate is effective as a foliar spray (4-5% of the concentrated product) for small plants. • Remove large buckthorn plants by cutting and basal-bark herbicide (Garlon 4) treatment, or by basal-bark treatment alone. Large plants that have been basal-bark-treated without cutting die in the first growing season and fall over in a few years. Cutting without herbicide treatment is worthless and pulling or digging will not remove all of the root mass from the soil. 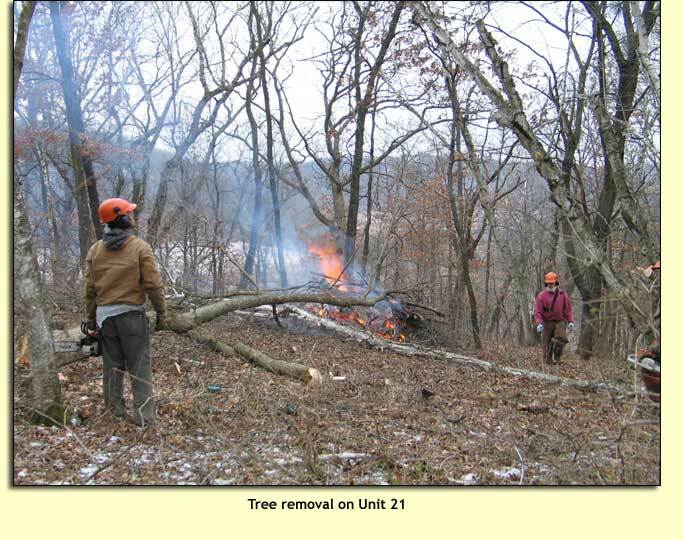 • Buckthorn eradication is a multi-year task. Follow-up treatments of all areas of infestation must be made. • After the initial removal, monitor the site carefully for the new seedlings that will inevitably arise from the seed bank, and immediately foliar spray with triclopyr (4-5% Garlon 3A). Plants should be sprayed in the spring, as soon as they are visible (around mid-May in our area). • Carry out controlled burns only after all plants have been cut and treated or foliar sprayed. Burning before herbicide treatment should not be done because all it will do is top-kill, and there will be no living stems left to transport herbicide to the roots. Also, burning will only result in resprouting and the formation of many stems where one was originally. • Do foliar spraying with triclopyr in the fall after the native vegetation has senesced. Buckthorn retains its foliage in the fall for weeks after the native vegetation has died back. This makes it possible to use a foliar spray selectively. 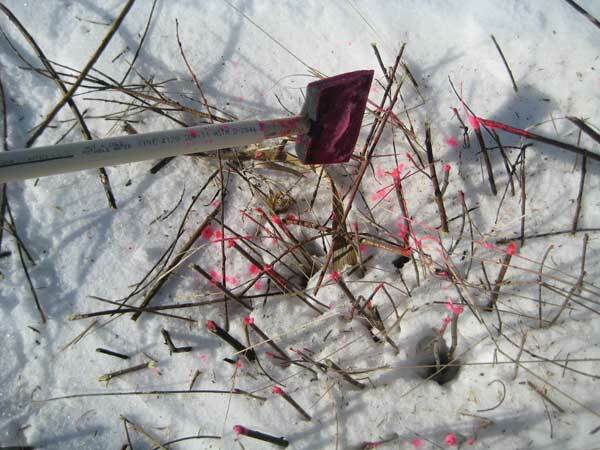 • Hand-cut and herbicide-treat small buckthorns in the winter. Although laborious, this procedure should be the most benign as far as the native vegetation is concerned. The herbicide should be triclopyr (15% active ingredient in oil) used as a basal bark. Do not treat only the cut stems, but also spray the stem below the cut down to the root collar (basal bark treatment), using a hand spray bottle. Avoid getting any herbicide on the soil itself, as triclopyr has a soil residual and may prevent native forbs from becoming established (although triclopyr does not affect grasses)..
• Burn in the spring in areas where buckthorn plants have already been removed. Spring burning is the best because it will come after the fall/winter control work, so that there should be no remaining buckthorn stems to be top-killed. Burning will also encourage the growth of native species, and their competition will hopefully help to suppress new buckthorn growth. 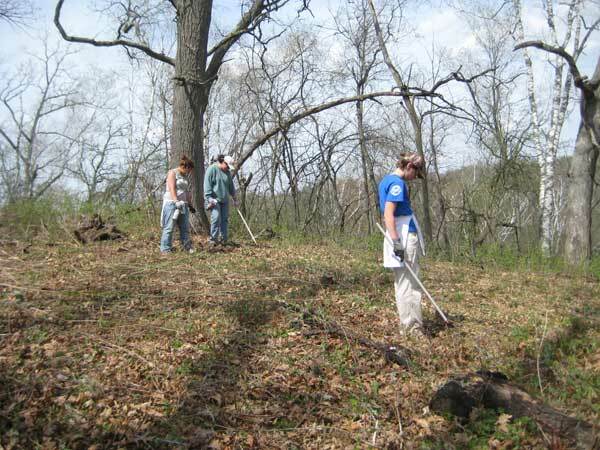 • Reseed with native species, especially in areas where large buckthorn infestations have been eradicated. For areas where triclopyr has been used, reseed predominantly with native grasses, since they are not affected by the herbicide. Although these areas may well start out as “buckthorn deserts” due to the residual effect of the buckthorn toxin, they should be planted anyway, since some of the newly planted species will become established. Unfortunately, there is no research on whether any native species are resistant to the toxin. Experience has shown that native species begin to dominate about the third year after buckthorn removal. • Continue monitoring for new infestations, and deal with them by the above methods. How long will the seed bank last? Unfortunately, there are no data on this, although in England (where it is native) casual observations suggested at least two or three years. Common buckthorn (Rhamnus cathartica) has been a serious invader of the oak savanna areas at Pleasant Valley Conservancy. Buckthorn was introduced into North America as an ornamental. It was planted for hedge rows in Wisconsin as early as 1849. Despite its insidious nature, it is still legally sold as an ornamental. It has become naturalized and has spread over most of the southern and eastern parts of the Wisconsin. Buckthorn is an especially troublesome invader of natural oak savanna and oak woodland areas of southwestern Wisconsin. The large buckthorn plants were dealt with by basal bark treatment with Garlon 4. Swaths were marked up the south slope and across the ridge top, and every buckthorn (as well as honeysuckle and prickly ash) was treated. This procedure was done in the winter, at snow-free times. The treated shrubs did not leaf out in the spring. Within two or three years, their roots rotted away and they fell over. The basal bark method is the most economical because it does not require cutting or burning. Once dead, the plant can be cut and removed, or allowed to stand to rot. We have used this procedure extensively at Pleasant Valley. It has the advantage that it is quick and does not require any cutting. However, if we are removing trees at the same time, the cut stump procedure described above is preferable. After an area was cleared, it was burned and then seeded with native savanna species. Burning provided extensive bare areas, providing open areas for the seeds to become established. The buckthorn seed bank. Because of the extensive seed bank, it was necessary to return to cleared areas and attack the new buckthorn plants that arose from the seed bank. Ideally, all new seedling should have been sprayed with triclopyr or glyphosate (at foliar concentrations), but this was not done. Thus, we had to return later, when the seedlings had already developed into small plants. Although the seed bank is no longer a problem, these small to medium sized buckthorn plants continue to be a problem. 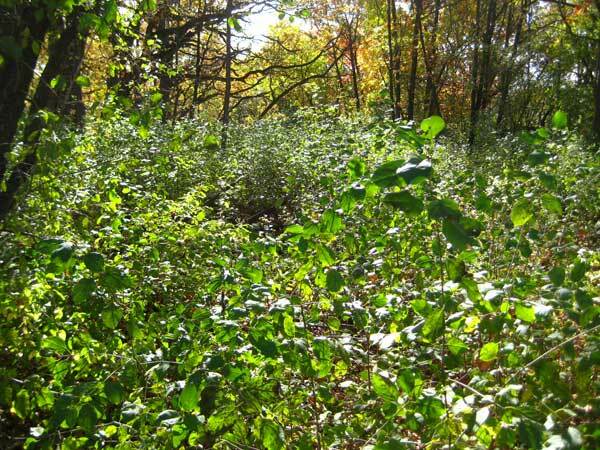 Every year we work extensively on several of our savanna areas, especially in the ridge top savannas where buckthorn presents the greatest problem. 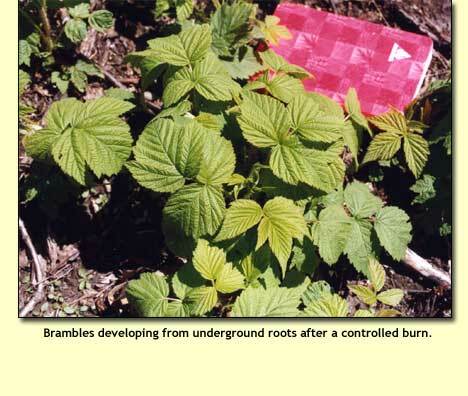 Brambles are biennial plants but have a perennial root system. The roots continue to grow for the life of the plant, but new above-ground shoots (generally called "canes") develop each year. The first-year shoots grow vegetatively but do not flower. In the second year these shoots flower, set seed (berries), and then senesce and die. The photo below shows the arrangement of canes, shoots, and roots at the base of the plant. There are several dormant shoots. Iif the above-ground shoots are killed by fire or cutting, one or more of the dormant buds will begin to grow and form a new canes. Some brambles (black raspberry, northern dewberry) exhibit a phenomenon called "tip-rooting." Canes whose tips reach the soil can form new roots, enabling the brambles to colonize new bare areas. Bramble patches with tip-rooted canes are especially difficult to walk through. Since flowers only develop on the second year shoots, annual fire will keep brambles from flowering and setting seed, but will not eradicate them. In the next growing season, each killed cane will develop a rosette of leaves from an underground bud. By mid-summer, a new vigorously growing cane has been established. Control of brambles in savanna restoration Although they are very fire-sensitive, they are not eradicated by burns, since the roots remain alive and resprout. 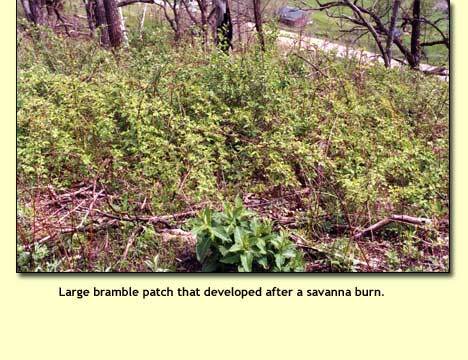 Eradication of brambles in savanna restoration can only be done with the use of herbicide. Even then, removal requires careful monitoring and consistent control. Bramble canes can be cut and the cut stems treated with glyphosate (20% active ingredient), as described above for honeysuckle. This procedure works well for blackberries, and reasonably well for black raspberries, but is generally ineffective for red raspberries. This latter species is a prolific clone former, and has an extensive underground root system. Herbicide treatment of cut stems does not work. Brambles are easily cut with hand clippers, and a single person can cut and treat an area, with clippers in one hand and herbicide bottle in the other. It is essential that every cane be cut and treated. Some of the canes may be dead. These do not need to be treated, although it is still desirable to cut them. Living cut stems are easily recognized because they will be green and moist, even in the winter. Eradication by the cut-and-treat method is very time-consuming, but is the surest way. Once the brambles have been removed, annual burns should be carried out for a number of years, since there will always be a seed bank, and in the absence of fire the area would eventually return to an unrestored state. In areas with large bramble patches, especially those where there are no "good" plants, foliar spraying can be done. Roundup (glyphosate; 1-1.5% foliar spray) is labeled for blackberry and should work on other members of the genus Rubus. According to the manufacture, best results are obtained when plants have reached full leaf maturity in late summer or fall. Garlon (triclopyr; 0.5-1% foliar spray) and Krenite (fosamine; 5-10% foliar spray) are also labeled by their manufacturers for blackberry and would presumably work for the others. However, all of these herbicides have the potential for harming nontarget plants and should only be used in areas where there are no desirable plants. One additional procedure that may aid in bramble control is to cut the plants in mid-summer, at flowering time. At this time of year, most of the nutrients are in the stems, and if these are severed the roots will be starved. We have found this procedure to be helpful, although it does not completely eliminate the brambles. One advantage of cutting at flowering time is that berries will not yet have been made, thus eliminating the chance of adding to the seed bank. Brambles are very sensitive to fire and are readily top-killed by a good burn, but the dormant buds (see photo above) soon begin to grow and form a rosette of new leaves. These rosettes can be treated with herbicide, such as glyphosate or triclopyr, at the low concentrations suitable for foliar spraying. Rubus always has an extensive seed bank, so that effective bramble control requires frequent, preferably annual, burning as well as reseeding with herbaceous savanna species, since competition from other plants is an important factor in keeping brambles from becoming reestablished. Because fire will not eliminate the seed bank, it is also essential to return to previously restored areas periodically and repeat the cut-and-treat method. Smooth sumac is a native shrub that can be a real menace in prairie and savanna restoration. It is fiercely clonal and spreads wildly from rhizomes. Left alone, it can take over a site and shade out everything else. Although annual fire keeps it under control, all one needs is a year or two without fire and it can be so big that fire won't get at it. In the fall of 2008 we did a major survey for sumac, and located at least 100 clones using GPS. These clones are shown on the map here. Each red dot represents a single clone, often with 50 or more stems. Click here to see how we are eradicating them. Eradicating sumac. We started our sumac work in November 2008, using the database depicted in the above map. When the early December snows came, we were stalled and did not return to finish the work until early March 2009. 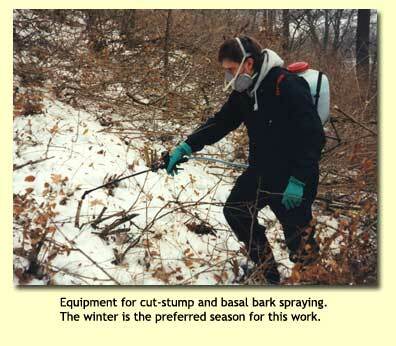 We used backpack sprayers and basal barked all sumac stems in a clone, using Garlon 4 in oil. At the same time that we were basal barking sumac, we also basal barked brambles, buckthorn, honeysuckle, gray dogwood, prickly ash, or any other undersirable woody vegetation. The basal bark treatment was quite effective and an underground examination of the stems showed that there were no living buds. Note that the buds were dead not because of the burns, but because of the basal bark herbicide treatment. Although the basal bark work killed the stems as well as the bud that was at the base of each stem, buds in the rhizomes themselves were not killed. The herbicide obviously is not transported along the rhizomes, or perhaps it is impossible to apply a high enough concentration to kill these buds. Thus, we had living shoots developing among the clones that had been basal barked. I did a count on one large clone. There were about 120 dead stems. By mid July there were almost an equal number of new shoots. Kathie set up an experiment on a large clone that had been basal barked but on which there were about 250 new shoots. She cut all of these with a hand lopper (a brush cutter could also have been used), and then did a basal bark treatment with Garlon 4 of all of the cut stems. This clone was carefully marked and observed for the rest of the summer. The basal bark treatment was very effective, and no new shoots were seen. However, we will have to wait until next year (or the year after) to see if we have completely eradicated this clone. We tried a different approach on some other clones that had many new stems. Instead of cutting the new stems and treating the cuts, we simply basal barked the new stems, using a spray bottle. All treated stems died. Again, we will wait to see what happens next year. Another sumac control activity will probably be more certain. We located all of the single (non clonal) sumac plants growing in either our prairie remnants (south-facing slope) or savanna remnants. Starting in early August, our summer interns basal barked these single plants. Within two weeks, all treated plants were dead. Since these are single plants rather than clones, there are no rhizomes to provide new buds, so we are assuming these plants will be killed. A number of these plants have been marked and will be monitored in 2010. Note that the single plants I basal barked in 2008 died and no new growth has occurred. Our work at Pleasant Valley Conservancy has shown that basal bark treatment with Garlon 4 is highly effective, and as long as one works to eliminate all new shoots arising from rhizomes one should be able to eradicate sumac. This is certainly a much more effective way that simply mowing, which does not eradicate. However, it is a multi-year job.